Create a style selecting from a range of kitchen accessories designed to be both functional and attractive. An array of wood serving trays, counter/surface Savers, latte mugs and floor mats that perfectly match your CALA Placemats and Coasters - all to complete your occasion, be it a special one or a daily event! These beautiful complementary kitchen accessories perfectly coordinate with the CALA hardboard gift sets and designed for today's casual dining and entertaining lifestyle, with a focus on art-driven transitional and contemporary on-trend patterns. Beautiful pastel Garden Images Natural matching coordinates a makes this CALA Design a favorite. It brings in the freshness of nature and whimsical touch of an artist's brush. The Garden Images Black design in functional coordinates that will inspire you to make every meal preparation memorable by bringing a work of art to your kithen. 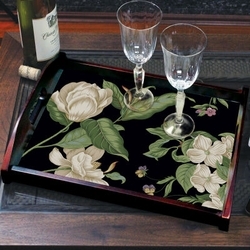 Matching Wood Trays, Glass Counter Savers, Floor Mats and Latte Mug - all in the Golden Leaves Design. Matching trays, mug, glass surface savers/cutting boards in the Citrus Garden Design. Exclusive from Jason Products of New Zealand. Beautiful kitchen essentials in the Illuminated Branches design. Exkusaive from CALA of USA - beautifully captured on trays, cutting boards, floor mats and mugs. Indulge in your passion for coordination in your kitchen accessories. Trays, glass surface savers and mugs - all in your favorite Blue Hydrangea Design from CALA of USA. Elegant wood serving tray and matching glass surface saver, latter mug and floor mat make this design set of kitchen coordinates a perfect gift to give or keep!